Dental implants offer a long-lasting solution to missing or failing teeth. Let Beautiful Smiles Dental Center be your trusted source for dental implants in Gurnee. Tooth loss can have a significant effect on your appearance and self-esteem. It also affects the health of your gums and remaining teeth, as well as your overall health. While there are a handful of treatment options to replace missing teeth, they wouldn’t look, feel, and function the same way. With dental implants, the outcome is more predictable, resulting in a level of comfort and chewing ability that cannot be achieved by other treatments. As a matter of fact, dental implants have been recognized as the only long-term and effective solution to tooth loss or failure. When you’ve lost a tooth root, a dental implant will take its place. It will act as the strong, fixed foundation on which the removable replacement teeth or bridge will be placed. While the implant acts as tooth root, the replacement teeth will be made to match the appearance and function of your natural teeth. They don’t require extra care, making it a hassle-free alternative to dentures. Do not require special cleaning methods or maintenance. When you experience problems with your teeth, the damage can sometimes be irreparable. Certain conditions can lead to premature tooth loss or you may be involved in an accident or incident that results in the loss of a tooth or multiple teeth. In some cases, even people who have not lost teeth hate the appearance of their natural teeth and want something done about it. One of the things that you can consider if you want to benefit from a full set of teeth and a beautiful, even smile is dental implants. 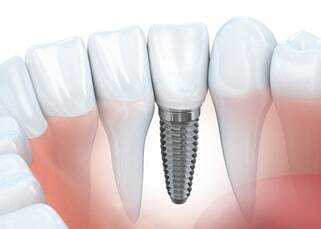 Over recent years, dental implants have become hugely popular amongst those looking for a tooth replacement solution. Whether you need one implant or multiple ones, you can look forward to having a replacement that is fully functional, feels natural, and is no trouble when it comes to cleaning and maintenance. The procedure is now very common and many people have benefited from having these dental implants fitted. Dental implants are able to provide a supportive solution for those that need replacement teeth. When it comes to your natural teeth, these are held in place by the roots in the jawbone. When implants are fitted they are fixed into your jawbone so that they are able to act like roots in order to hold the false teeth or crowns in place. The great thing about implants is that if they are properly looked after they can last for the remainder of your years, so you won’t have to keep paying for costly treatments or replacements. People with dental implants are able to enjoy life to the full. Sometimes, those that wear dentures struggle to eat or speak properly and they have to put up with some discomfort. However, implants feel and look completely natural so you can eat, talk, smile, and laugh as normal without feeling embarrassed or uncomfortable. This is one of the many reasons why implants have become such a popular choice among those looking for replacement teeth. Expertise and experience: When you are having this sort of dental work carried out, you may want to look into the level of experience the dentist has with implants. Look into how long the dentist has been performing this sort of procedure, as this will give you a better idea of experience. You may also want to look at reviews from people who have had this type of implant work carried out by the dentist to see how happy they were with the process and the results. The cost of treatment: Having implants can be expensive but you need to remember that they can last for life. The cost of this treatment can vary from one dental clinic to another, so you should look into the cost so that you can get the best value for money. However, do be mindful not to skip the importance of experience and expertise simply to keep costs down as this could end up costing you more in the long run. The systems that are used: There are various implant systems in use today, so you may want to speak to the dental clinic about the one that they generally use and what the benefits are over the others. Some of the implant systems that may be used include Straumann, Ankyloss, biomet 3i, Astratech and Imtech. Looking at these factors will make it easier to determine which dentist you should use when having dental implant surgery. What are the key benefits of dental implants? They feel natural: Unlike many other tooth replacement solutions, implants feel really natural once they have settled so you don’t have to worry about feeling uncomfortable or experiencing discomfort all the time. You can eat, talk, and smile as normal with the confidence that you have a dazzling set of teeth that will turn heads. They look great: Dental implants look really great and can make a huge difference to your smile as well as your appearance. The implanted teeth will enable you to enjoy an even, natural smile, which can work wonders for your self confidence as well particularly if you have been troubled by damaged teeth in the past. They can last for life: Like your normal teeth, you need to ensure you look after your implants once they are in and settled. However, this will definitely pay off because as long as you look after them the implants can last for the rest of your life so you will no longer have to worry about things such as replacement dentures or other tooth replacement costs. Improving self esteem: If you have missing or damaged teeth, it can have a serious knock on effect on your self esteem. Many people with damaged teeth don’t even like smiling or eating in front of others because they are embarrassed about the appearance of their teeth. Having dental implants can restore that lovely smile and this will have a positive effect on your confidence levels and your self esteem, as you will be more than happy to laugh, smile, talk, and eat with others around. Improving speech: If you have dentures that are not properly fitted, they can often affect your speech. As a result many people end up paying for dentures and then hardly ever wearing them because they don’t want their speech to be impaired as a result of the dentures slipping. With implants, this won’t be a problem because they are permanently fixed and therefore cannot slip. Higher levels of comfort: Anyone that has worn dentures in the past will know that they can cause a lot of discomfort. However, the implants are a part of you once they are fitted and this means that you won’t have to worry about feeling any discomfort. They will simply feel perfectly natural. Making it easier to eat: When it comes to eating, having missing teeth or removable dentures can make life difficult. With dentures, they can slide around and this can make it very difficult to chew food. When you have dental implants, this is another worry that can be eliminated as you will be able to eat perfectly normally with your implants. They are permanent: Aside from all the other issues, another problem with dentures is the inconvenience and embarrassment of having to keep removing them and then putting them back in. With dental implants, these are permanent fixtures in your mouth just like natural teeth. So, you won’t have to worry about taking them out and putting them in as and when required. With so many benefits, it is little wonder that more and more people have opted for dental implants when considering a tooth replacement solution. The process of dental implant surgery can vary from one person to another based on the amount of work required. It also depends on the type of implant as well as how healthy your jawbone is. For instance, in some cases a bone graft may be required if your jawbone is not healthy enough but this is something that the dentist will be able to determine during consultations and x-rays prior to surgery. In a nutshell, metal posts are screwed into the jawbone for each of the teeth that need to be replaced. The titanium in these posts is able to fuse with your jawbone, which means that there is no risk of them slipping and moving around. In order to provide the right level of support for the new teeth, the bone has to heal properly and tightly around the implants. The entire process can take months to complete because this healing and tightening process does not occur overnight. However, you need to remember that the treatment time varies based on the health of your jawbone and whether teeth need to first be extracted. This means that it could take anything between several months to twelve months for the treatment to be completed. If you have missing or damaged teeth and you want to consider implants rather than having to wear dentures or bridges, the first thing to do is speak to your dentist. You need to make an appointment so that the dentist can carry out a full assessment and examination, as this is the only way to determine the level of work required and to sort out a suitable treatment plan. Once the dentist has carried out this examination and performed x-rays, he or she will be able to determine what sort of treatment plan is right for you and what the likely length of the entire process will be. One factor that will affect this includes whether you need teeth extracted or your teeth are already missing. Another will be based on assessment of your jawbone following the x-ray, as this will enable the dentist to determine the health of your jawbone and whether a bone graft is going to be necessary. Once all of this has been done, a treatment plan is put into place whereby you will attend to see your dentist in sessions to have the work carried out bit by bit. Once the treatment plan is in place, you will have a far better idea of exactly what needs to be done and how long it will take altogether. However, there can be delays in the event of complications occurring such as the bone not healing around the implants as it should. Once you have had the dental implant treatment and the implants have settled, you can look forward to life with a dazzling new smile and newfound confidence. You will be amazed at just what a change dental implants can make you your appearance and your confidence levels. The best thing of all is that they not only look great but they also feel like your natural teeth so you don’t have to worry about putting up with discomfort in the same way as you would with dentures. Why Choose Beautiful Smiles Dental Center? At Beautiful Smiles Dental Center, we are driven by one mission: to restore our patient’s teeth so they can smile confidently again. Combining the most advanced dental implant technology and years of training and experience, we are able to perform successful restorative procedures. Our convenient location in the heart of Lake County allows us to serve clients coming from Gurnee, Park City, and Waukegan (and other nearby suburbs of course). Use our online booking system and fill out our new patient form prior to arriving for your appointment, in order to ensure a seamless experience. Speak to one of our dentists about our dental implant options. Call us today at (847) 249-5700 for a free consultation.